Canada bagged another three golds on the penultimate day of the Winter Olympics on Saturday to ensure they will finish top of the medal standings, triggering wild celebrations across the country. It is the first time Canada has topped the medal standings at the Winter or Summer Olympics and followed a remarkable turnaround in fortunes. "Everyone was worried that we weren't going to get a gold medal on home soil. To come out with the most number of gold medals is the complete opposite," said Lucas Makowsky, a member of the Canadian men's speedskating pursuit team that struck gold. "It's something that's pretty incredible for our Canadian athletes and our sporting system in general." Snowboarder Jasey Jay Anderson won the men's parallel giant slalom and Canada's men also won the curling final to lift the home nation's golden tally to a record-equalling 13 with just two events left on Sunday before the closing ceremony. 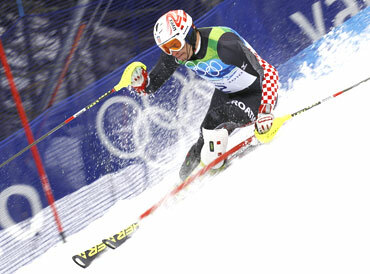 Giuliano Razzoli, who grew up admiring Italy's skiing great Alberto Tomba, prevailed in the slalom on a tricky course where poor weather in the first leg tripped up nearly half the racers including Olympic comeback kid Bode Miller. The 25-year-old Razzoli, who had clocked the fastest time in the first leg through fog and sleet, became the first Italian man to win the title since Tomba 22 years ago in Calgary. "I told him, have your eyes open and be fast and ferocious. He handled it the way he had to," said Tomba, who was at Whistler mountain to watch the race. Italy and Poland both won their first golds. Poland won their first gold in the women's 30 kilometre cross country race as Justyna Kowalczyk sprinted to the finish to deny Norway's Marit Bjoergen her fourth gold by less than a ski's length. Germany's Evi Sachenbacher-Stehle won the bronze while Bjoergen's consolation silver gave her a fifth medal from five events, the most by any athlete at these Games. "It's going to take a while to understand what I have done during these Olympics," she said. "I dreamed of taking one gold and now I have five medals, three golds." The German women won their speedskating pursuit final following a bizarre semi-final in which Anna Friesinger-Postma belly-flopped on the ice in the final straight and paddled across the line in the nick of time. The Germans replaced Friesinger-Postma for the final, where they beat Japan for the gold. The bronze medal went to Poland. "I thought I had messed it up," Friesinger-Postma said. "But, you see, impossible things can happen." 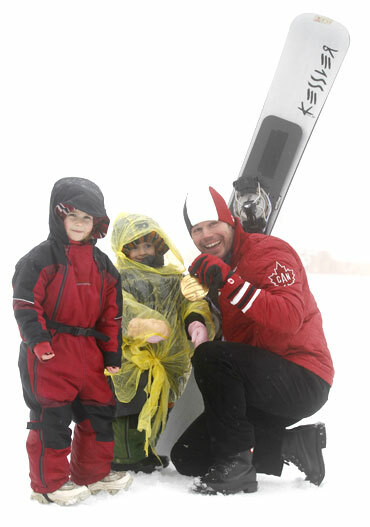 Saturday's outdoor events were plagued by inclement weather with the snowboarders and Alpine skiers barely able to see their courses because of the heavy fog, not that the winners were complaining. "Pretty hard to beat, eh? 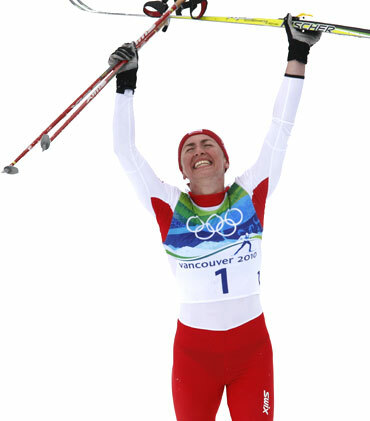 Olympic gold at home," said Anderson, who won gold at Cypress Mountain by beating Austria's Benjamin Karl in the final. Croatia's Ivica Kostelic finished second behind Razzoli to collect his second silver of the Games and Sweden's Andre Myhrer took the bronze. 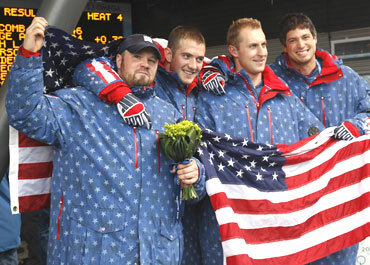 The Americans won gold when their so-called "Night Train," the four-man bobsleigh team led by Steve Holcomb, earned the US their first triumph in the event since 1948. Germany were second and Canada third. "No more 62 years," Holcomb said. "We'll start the clock over. Now it's going to be four years." 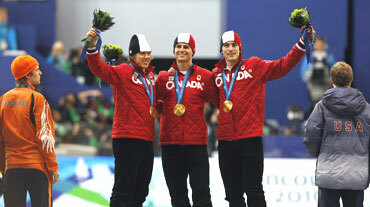 Canada beat the US in a tight race to win the men's speedskating pursuit final with the bronze going to the Netherlands. The host nation then defeated Norway in the men's curling final, the last gold medal decided on Saturday, with Switzerland claiming the bronze. Canada's total of 13 golds equalled the record for the most for any country at a Winter Olympics after the Soviet Union won 13 at Innsbruck in 1976 and Norway matched the mark at Salt Lake City in 2002. Canada would set a new mark by winning either of the two golds on offer on Sunday, the men's 50km cross-country skiing and the men;s ice hockey final.